If Drama High were a movie, it would be formulaic. A closeted gay teacher leads several generations of high school students out of the darkness of their dreary existences and into the joyous light of theater. The struggles, the heartbreaks, the ecstasies, the triumphs . . . it’s all there. Many decades ago, Judy Garland and Mickey Rooney might have starred as students and perhaps Jimmy Stewart might have been the teacher. As a book, it is equally formulaic. It follows a well-trodden path, and it picks up all the appropriate artifacts along the way. Like a good war movie, the cast of characters is diverse and represents a cross section of society. That means almost all of them could be described with the word “the” before their introductions. There is the shy one, the brilliant one, and, of course, the difficult-one-who-is-won-over-to-the-wonders-of-theater. 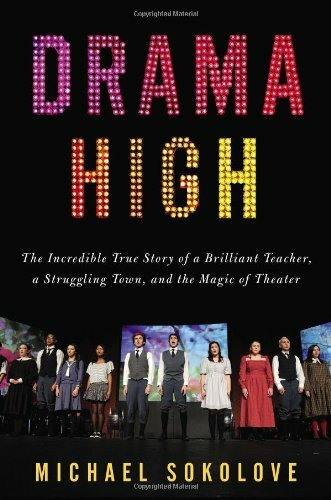 Yet for all its flaws, Drama High manages to hold our attention. Mr. Sokolove is a competent writer, and he knows how to stack all these familiar building blocks with a smoothness that falls just short of elegance. His word flow can’t be mistaken for literary greatness, but it brings forth the images he wishes to share with his readers. The author’s choice of Lou Volpe, the brilliant teacher of the book’s wordy subtitle, is neither casual nor accidental. Mr. Sokolove grew up in Levittown, Pennsylvania, the book’s locale, and Volpe was his drama teacher. Author Sokolove, like the legions of students before and after him, developed a degree of hero worship for this dedicated teacher who touched and, almost invariably, changed their lives. The book is a well-deserved personal tribute. Volpe’s story is interesting. His work, teaching and creating high level theater art in an economically challenged town on the edge of Pennsylvania’s “Rust Belt,” is praiseworthy from every point of view. The struggles with school boards, the need to schedule rehearsals around the jobs held by most of the working class students in the hard scrabble region, the lack of funding, and all the other battles Volpe fought and won, are all predictable. They are the realities of a teacher’s life and Volpe’s victories, while admirable and inspiring, are not unique. There is probably a hard working, caring “Volpe” in more than half of the school districts in the nation. Caring, and the desire to give positive influences to young people, are major motivations for entering the underpaid and under-appreciated field of teaching. Where Lou Volpe does stand out is in the level of his success. His high school productions drew the attention and praise of theater professionals from Broadway and beyond. His vision and energy brought hope to students whose other sources of hope and inspiration were limited.